Have you been in talks with Toyota? We have. They are relatively superficial talks and just testing the water without any concrete potential outcome in the short term. This is very typical of many companies in our industry. Emerging markets offer the greatest long-term growth potential for Mercedes-Benz's global passenger-vehicle sales, says Daimler AG CEO Dieter Zetsche. But Zetsche says Mercedes won't need special vehicles or a cheaper subbrand for those markets. He says buyers in emerging countries want luxurious German premium cars, too. In the more immediate future, Zetsche expects moderate sales improvement, but he says the U.S. market is growing slower than expected. 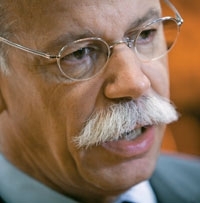 Zetsche, 57, was interviewed last month at the Paris auto show by a roundtable of journalists that included Staff Reporter Diana T. Kurylko. Will there be an automobile in 25 years' time, and will it have the same impact on society? Mobility is very valuable to people, and I am convinced that in another 25 years, people will not want to depend on their legs exclusively nor want to be packed in a form of combined carriages, either. What kind of technology -- whether it is wheels or flying -- I don't know. But I am sure people want to use technology to move from A to B fast, comfortably and in a nice way. And they enjoy their closed-up space where they are somewhat protected from what is going on around them. Has Mercedes recovered from the recession? The market developed better for all of us than anyone would have expected. That is at least as true for premium markets. We as Mercedes-Benz have clearly gained market share on a global basis within the premium segment. We have overproportionately benefited from this tail wind and this growth. What are your U.S. market expectations? In the U.S., the total development is a little disappointing. There were expectations ranging from 11.5 to 12 million unit sales in the beginning of the year. We would be glad if the market reaches 11.5 million, but it doesn't look like it will. When looking at it in detail, it is almost all fleet which produced the growth over last year, and retail has been almost flat for eight months. We are 17 percent up, and we are not selling fleet. We are very happy with the position we are in. We are the strongest European manufacturer as far as growth is concerned and as far as absolute numbers are concerned. But that is not a position we are striving for. We want to make money, and we don't care if we end up five units up or down from any competitor. Generally speaking, the markets are good to us, and we expect that next year we will see growth on a global basis, though somewhat less profound than this year. September sales will be the 11th month of two-digit growth, and we expect the best September ever on a global basis. You said in the next 25 years your sales will reach 1.8 million from about 1 million because of emerging markets. Who will benefit most in those regions: inexpensive brands such as Dacia or premium brands such as Mercedes-Benz? We have seen the market share of premium cars as part of the total market in China growing to three times the volume it had 10 years ago. So far the growth in this segment is much faster than the overall market. It is never a good idea to forecast the future, but I imagine it will continue the same way. There are many reasons to believe that going forward, the total share of premium cars will at least stay as it is today. My bet would be we gain an overall proportional piece of this total growth. Will you need a cheaper brand to compete in a lower segment? Last year some people assumed that premium products as a business model might be broken. I disagreed at that time, and it is easy to prove today that I was right. I am pretty sure that we have a very good business model by focusing on the premium market, and we have no plans to go volume. What are the plans for Smart? Among other things, we joined forces in particular areas with Renault-Nissan to set the base for the future of Smart. In combination with the Twingo, we will develop a new platform based on the architecture of Smart, which will then allow us to have a next-generation two-seat Smart and a four-seat Smart. [The new four-seat Smart] will be a family member but not an independent second vehicle, as it was in our last round with the four-seater. This is the strategic basis for a positive and expansive development with Smart. Is the global recession over, or will we have a second dip? We are watching that very closely and looking at all the indicators. You always have to talk in scenarios. We do not expect the current level of growth to continue. We expected continued growth to be a little moderate -- a kind of stabilizing pattern when you have a steep recovery. There is a 15 percent likelihood of a double dip. You can't exclude that, but we look at it as being very unlikely. You are involved with Renault-Nissan and also with Tesla for batteries. Renault and Nissan are very strong in electric vehicles and hybrids. What is the big picture for cooperation in electric vehicles? We started cooperation with Renault-Nissan in very clearly defined areas of strategic importance to us. At that point in time, electric vehicles were not the core of our cooperation. Meanwhile, we have realized that Renault-Nissan on the volume side and we on the premium side are probably the two most ambitious companies when it comes to electric cars, which definitely opens up quite an opportunity. We have an opportunity to merge our development lines, and we are making good progress doing that. This is not in conflict with Tesla. We had talks with Toyota for years and do not expect any specific results in the short term and perhaps never. Our priority is Renault-Nissan. Does Maybach have a future? During the crisis, Maybach was not our No. 1 priority. Customers are happy. If we sell 10 to 20 percent more or less, we do not see it on our bottom line. It is nothing to worry us. We are evaluating options which potentially could expand or maintain what we do. That is something we can look at in a very relaxed way. We have started to make sure the current vehicle can stay in the market through developments on the legal side. There are rumors that you are also talking with Aston Martin about supplying components such as engines and transmissions? We all know each other. I have known [Aston CEO] Ulie Bez since kindergarten. Of course, you meet at auto shows and see if you could do something together. It is a possibility that all these smaller brands need some foundation for new technologies. An electric architecture is not sustainable on a 4,000- to 5,000-vehicle base. It is possible we will do something in the future. We will see. All the growth appears to be in China. How open are you to developing products specifically for China and for emerging markets? We are selling premium cars; we are not selling to the average man or woman. Our customers in China have a clear understanding of the world. They are interested in a German brand and in particular in the best German brand. It would not be well-advised for us to try and make a Sino-type Mercedes-Benz. That is not what they want. They want space in the rear, and we have the stretch version of the E class in China only. We have no plan to make a Chinese or Indian version or whatever of a Mercedes-Benz. That is why we are so successful.